After charges against Jussie Smollett were dropped, Chicago’s mayor and top police officer passionately denounced the decision. 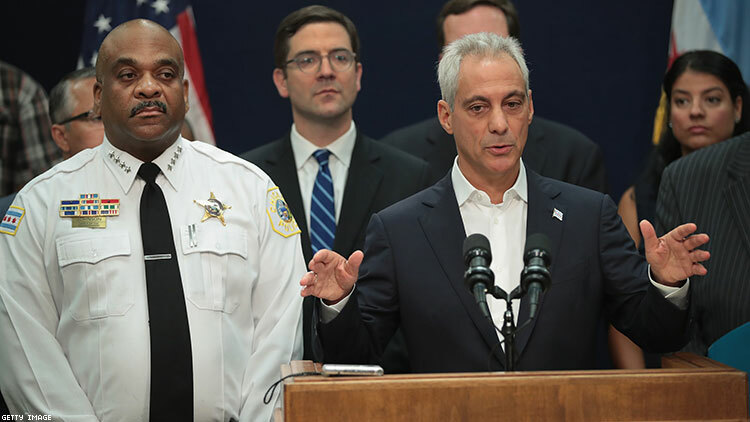 Mayor Rahm Emanuel lashed out, stating that the decision to let Smollett off is a “whitewash of justice.” Superintendent Eddie Johnson echoed these feelings, and said that he doesn’t feel justice has been served. “I stand behind the detectives’ investigation,” the city’s top cop told reporters. As news of the stunning reversal emerged, a shockwave was sent through the city as the investigative teams who have argued that the actor faked a hate crime in January were alerted that the case was over. Charges being dropped was a decision that no one, not even the mayor of the city’s top cop, was informed of prior to the announcement. "It's Mr. Smollett who committed this hoax," said Johnson. "Period." Both men were attending a police graduation at the city’s famous Navy Pier when they were informed of the decision, and were visibly angry, according to sources. Records involving Smollett's case will now be sealed by the state, a decision that his attorney couldn't elaborate on how or why. However, she stated that this was the "right" decision by the state. The prosecutor's office shelved the decision on Smollett's case due to community service and a bond payment. “After reviewing all of the facts and circumstances of the case, including Mr. Smollett’s volunteer service in the community and agreement to forfeit his bond, we believe this outcome is a just disposition and appropriate resolution to this case,” the Cook County State's Attorney's office said early Tuesday morning. Smollett’s record will be wiped clean of any filings against him, according to prosecutors, and the actor will also no longer face any charges by the Chicago police department. First Assistant State’s Attorney Joseph Magats, who oversaw the case after State’s Attorney Kim Foxx recused herself, told The New York Times that his office was not “exonerating” Smollett with this decision. The chief communications officers for the police department took to Twitter to defend the work of the detectives. "Chicago police detectives did an excellent investigation and their work was reaffirmed by an independent grand jury who brought 16 criminal counts," Anthony Guglielmi said, referring to the investigation that did produce multiple charges for Smollett. Guglielimi continued by questioning Smollett's innocence due to his willingness to adhere to terms set by prosecutors. "In our experience, innocent individuals don't forget bond and perform community service in exchange for dropped charges," he said. Smollett made a brief comment to the press after meeting with Chicago prosecutors to be informed he would no longer be facing charges. He stressed that he was “100 percent consistent” in his story the entire time, and was deeply thankful to those who supported him throughout the case. Smollett stressed that he would never fabricate a story of this magnitude as an activist because he is aware of the damage it could do to LGBTQ people, Black people, and other minority communities. His defense team is now using this treatment as a prime example for why Chicago police should not use the media as a way to “charge” people like Smollett. Smollett’s team would not comment on if charges will be filed against the two brothers who cooperated with police in the investigation into Smollett’s incident. Both the Chicago police and State's Attorney's office were asked for comment, but neither responded at the time of reporting. Abel and Ola Osundairo previously told police that they staged an attack on the actor the night of the incident, and conspired with Smollett. They were originally arrested on aggravated battery charges but released after interrogation, according to police arrest records obtained by The Advocate. Smollett says he hopes to move on with his life now. However, the fallout stemming from this specific incident seems to not be completely over. Smollett is still removed from his television show Empire and the FBI continues to investigate hate letters sent to Smollett prior to the violent incident.